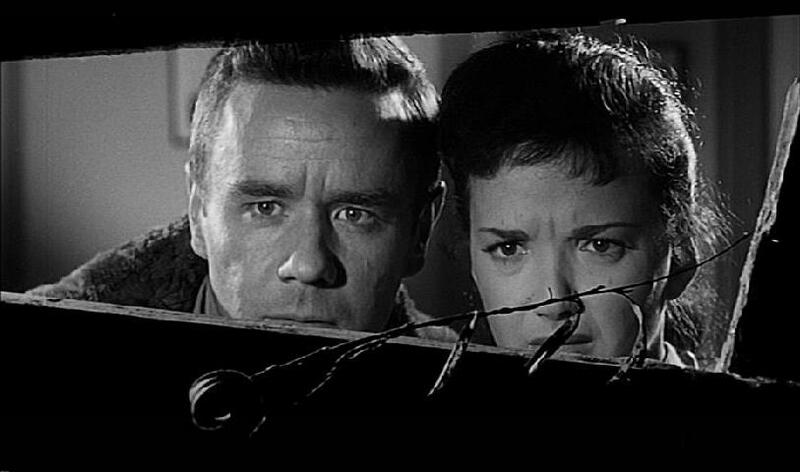 The 50's was full of Sci-Fi - Horror films, some were great some were best left forgotten, but this film always seems to be the one that gets brought up on many lists from that era. 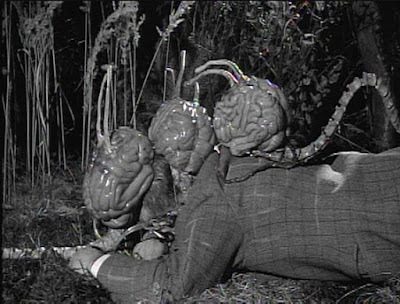 Admittedly it has only been over the last few years that I started watching these 50's Sci-Fi/Horrors, it was just something that never really grabbed my attention and I always found something else. Once I started watching them I found it really hard to stop and I had to kick myself for waiting so long to watch some of these absolute classics, I truly had been missing out and that included this amazingly enjoyable film. Sure it hasn't exactly aged well and yes it is extremely campy but it's so entertaining and it manages to keeps you interested. The story itself is intriguing, it's a true testament to it's time and place in history. 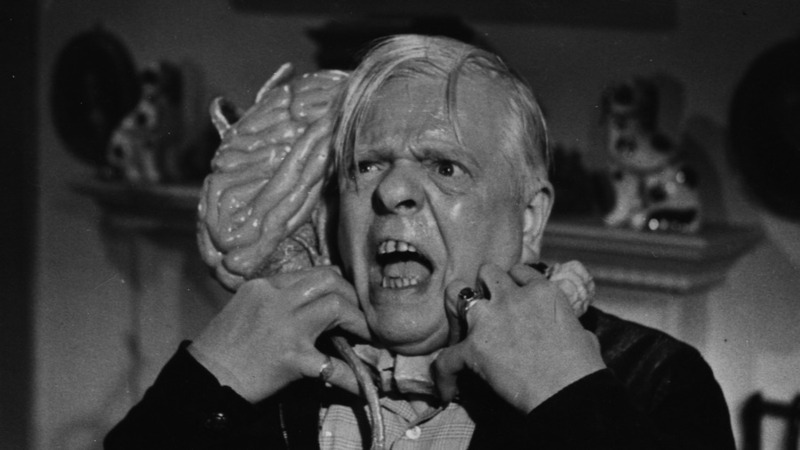 Lead Marshall Thompson stated that director Arthur Crabtree didn't want to direct the film, he thought sci-fi was "beneath him" and often didn't show up for work. Eventually, according to Thompson, Crabtree walked off the picture, and Thompson himself finished directing it. 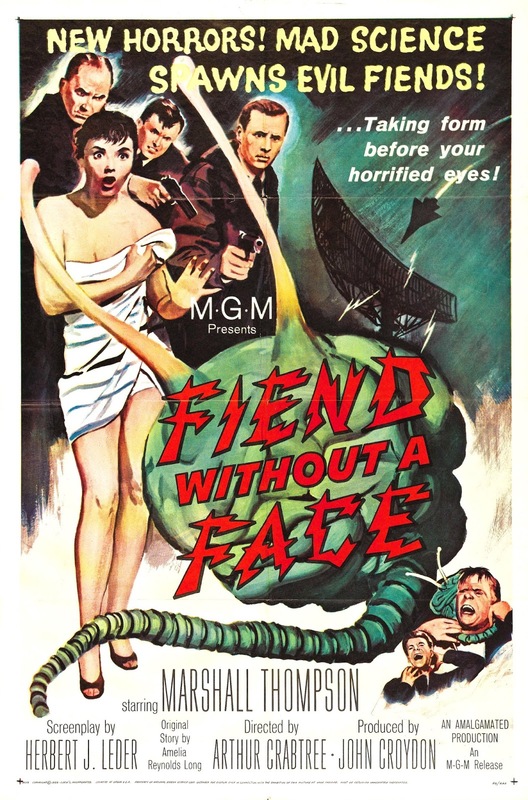 "Fiend Without A Face" is a classic example of 50's Sci-Fi/Horror, great sunday viewing! A publicity stunt went somewhat wrong in New York City. The Rialto theater in Times Square featured a sidewalk promotion for the film...one of the prop "brain creatures" was displayed in a cage, wired for sound and motion. The crowd it attracted grew so large that the NYCPD had it removed. The film created a public uproar after its premiere at the Ritz Theater in Leicester Square. The British Board of Film Censors has already demanded a number of cuts before granting it the "X" certificate. In the US, MGM distributed this film second on a double-bill with Torpedo Run (1958).